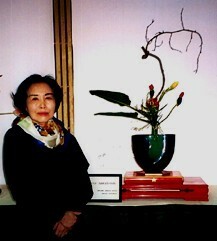 Senior Professor Ikka Nakashima founded the Chicago Chapter of the Ikenobo Ikebana Society in 1964. It is the fourth oldest chapter in North America. The daughter of a successful Japanese industrialist in Hokkaido, Japan she began her studies in kado and chado at the age of five and attended school with members of the Imperial family. After her marriage to an American Sergeant she met in post-war Japan, she moved to the United States and gained the American citizenship of which she was so proud. She set about teaching thousands of student over 50 years the arts of ikebana (flower arranging), chado (tea ceremony), shodo (calligraphy) and Japanese classical dance - all this in addition to her career as a microbiologist. In 2006, Professor Nakashima was invited to the Imperial Court in Tokyo to receive the Order of the Rising Sun, Gold and Silver Rays, from Emperor Hirohito for her tireless efforts to educate and spread traditional Japanese culture. In 2010 she designated Professor Charles Harris her successor in the Chicago Chapter. She died in 2014 and her heir, Ameer Ali, donated to the Chicago Japanese Culture Center her extensive collection of kimonos, obis, tea ceremony implements, ikebana containers and other cultural items so her teaching legacy could continue.